This outfitter’s clients take some truly awesome animals. Surprising, the size of his Alberta antelope are incredible. The outfitter’s mule deer typically range from 160- to over 200-imch class. The outfitter’s clients take some big white-tail bucks, there are Shiras moose available and some decent elk too. Alberta has some huge cougar and black bear as well. That makes for a full plate, folks! The outfitter has guaranteed licenses, meaning no draws to enter, when you book your hunt, the dates and species of your choice are guaranteed. MULE DEER: Big bodied bucks carrying large antlers are an Alberta trademark. Alberta’s reputation for big whitetails is well known, but the mule deer hunting in Alberta is also second to none. Many of our clients will see more true trophy class mule deer bucks on one hunt with this outfit– than they may have seen on all their previous hunting trips elsewhere. Please note- this outfit offers two types of mulie hunts, a Mountain hunt and a Prairie hunt. And it is possible to combo the MOUNTAIN mulie hunts with whitetail, elk, moose or black bear. MOUNTAIN MULIE HUNTS: Legally -Two types of mulie hunts- Prairie or Mountain. The Mountain hunts are longer than the 4 day prairie hunts. Prairie hunts are shorter, due to much less cover so the deer are far more visible, easier to take, and where some giant prairie bucks are found. The mountain hunts also produce some huge deer, but you will work a bit harder to find them! However the mountain experience is a grand one! You can hunt from September into November. In September mulie bucks are in their bachelor groups, and by Nov. both species of deer are rutting; and you can also do a trophy whitetail/mule deer combo hunt. If so inclined you can add on antelope with these hunts, season allowing. Or add on elk, moose, or bear! The October mountain hunt is a timberline high country hunt with great scenery and bucks in their bachelor groups. If you want to combo with whitetail, we suggest you do not start earlier than the last week of October to catch early rut activity. November is rut. On these mountain hunts you can also combo with elk, moose even bear. The season continues through the rut, to the end of November. For these hunts you will either stay at one the wilderness tent camps or take daily trips from their home with the horses and trailer to one of several trailheads that lead to their trophy deer hotspots. For much of the area, no motorized vehicles are allowed and so access is only on horseback or foot, further limiting hunting pressure and ensuring that mature trophy deer are available year after year. PRAIRIE MULE DEER HUNTS: The prairie deer hunting season is restricted to four seasons – each of which is a four day season by law, unless you are bow hunting. The rifle hunts take place every Wednesday thru Saturday in November. This is a three-day combination whitetail and mule deer hunt. Although some great whitetails are taken in the prairie zones, those areas are best known for the trophy mule deer, which are the priority on this short hunt. The terrain consists of prairie grassland, grain fields, coulees and river bottoms. You can expect some longer shots on both mule deer and whitetails in this open country. Accommodation can be either ranch house or motel, depending on the exact area you are hunting, transportation is by 4X4 or on foot. Archery spot and stalk is fabulous here- 6 days for only $4500- and you will see the deer of a lifetime- course shooting him is the challenge!! Lic. $275. Expect to glass some monsters up! And you will be into big mulies every day, normally! ANTELOPE: Many people are surprised to learn that not only does Canada have a good population of pronghorn antelope, but also that southeastern Alberta’s prairie country produces many super trophies every year. Alberta antelope are renowned for exceptional mass. Recent changes in antelope management have allowed more pronghorn bucks to reach maturity, resulting in bigger trophies than ever before being taken. The record book is being re-written nearly every year. They have an outstanding success rate on pronghorn antelope, with an average harvest size of 15″ but with scores that often reach into the 80” range. They offer a 5-day hunt to ensure ample time to look over numerous trophy antelope. The season varies slightly year to year, between late September to late October. Can also be comboed with other species. One recent buck scored officially 82 and 2/8ths. COUGAR: Alberta cougar hunting is truly beyond compare. Not only is Alberta blessed with the largest subspecies of cougar in North America, the largest specimens of this subspecies ever documented have been from here. Add to that, cougars in Alberta occupy habitat that is more accessible than that found in many other places. Therefore, regardless of your physical condition, your odds of success are likely higher in Alberta than anywhere else. This outfitter took a 218-pound cat which scored the highest ever taken in Alberta. The season is December, January and February. During the hunt travel the backcountry using four wheel drive trucks and snowmobiles to locate a suitable track. From there the pursuit will be on foot with hounds. Although the average time to harvest a cougar is 5-6 days, we like our hunters to allow for a 10 day hunt for weather, etc. ELK & MOOSE: Rifle elk season begins September 17, during the peak of the rut. You hunt the foothill and mountain zone on horseback and on foot, glassing and calling. This is prime bugle time in a limited entry area with a 6 point minimum (on one antler) rule, which ensures that mature trophy bulls are available. This hunt can be scheduled to combine mule deer or black bear, as well. The rifle moose season begins the following week (September 24) and coincides with the peak of the rut. This hunt is conducted in the same area as the Elk and similar hunting methods are used. This hunt can be combined with mule deer, whitetails or black bear. 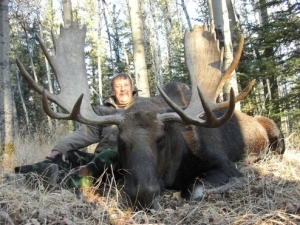 The moose are classified as Shiras moose by Safari Club International and as Canada moose by the Boone & Crockett Club. Although 50″+ moose are not uncommon, we consider 45″ to be a realistic goal for our hunters. BLACK BEAR: Bear hunts are 6 days in length. They offer both a spring and fall spot and stalk hunt, in an area with a high percentage of color-phase bears. They estimate that half to three quarters of the bears in the area are some color phase other than black, ranging from blonde to chocolate brown. Spring black bear season runs from late April to mid May. You will use horses to explore newly green trails and meadows where bears like to feed after hibernation. South facing slopes are where spring gets its start, so you will spend time glassing for bears searching for new growth in those spots also. Fall black bear season runs from early September until they den, which is usually early November. The hunting method is much the same as the spring hunt, with the bears feeding primarily on berry covered slopes. A fall bear hunt combines well with mule deer, whitetails, moose or elk. Pronghorn antelope can be added, either before or after a fall bear hunt. Accommodations are ranch house or tent camp as required. ATTENTION BOW HUNTERS: Enjoy an excellent opportunity for bow hunters with our elk and moose combination hunt. The archery season begins early in September, at the beginning of the elk rut. Therefore, our priority is calling in elk with the added option of spot and stalk moose hunting as well. Towards the end of the archery season the moose begin to respond to calling and can be brought in to close range. ATTENTION GUN HUNTERS: BOWS AND GUNS: You are allowed to bring your personal firearms with you. This includes your rifles and/or shotguns. For your firearms, a simple one-page form is required to be filled out to obtain a temporary Canadian Firearms permit. This form (CAFC 909) can be down-loaded or mailed to you well in advance from THE CANADIAN FIREARMS CENTRE at www.cfc-cafc.gc.ca click on the link on the left hand side for visitors/non residents, then download the NON RESIDENT FIREARM DECLARATION (form CAFC 909). Completing this in advance should reduce your time clearing customs. BMOA can help you complete it. Do not sign it until you appear in front of Customs- but fill it out. A confirmed declaration costs a flat fee of $25, regardless of the number of firearms listed on it. It is only valid for the person who signs it and for those firearms listed on the declaration. It is a simple form to fill out. IF YOU HAVE A DUI OR A CRIMINAL RECORD- CALL US! You may be denied admittance with a firearm. Hunt in November in the Eastern slopes of the Rocky Mountains. Stay in tent camp or ranch house as required. Use horses on mountain trails to reach those places that hold trophy deer. Spot and stalk, rattling and calling, still hunting and stands are the methods used. Start/end the hunt in Calgary. Airport or hotel pick up included. Spot and stalk RIFLE hunting on the prairie, each Thursday, Friday and Saturday in November. Mainly a mule deer hunt with the added possibility of a whitetail. Depending on the hunt unit, you will either be met in Calgary or rent a vehicle and drive to the “meet your outfitter location”. 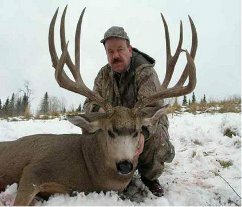 License Cost $500.00 OR:DO ARCHERY SPOT AND STALK FOR HUGE MULIES- 6 DAYS $5500 !! Hunt the beautiful Alberta prairie for your trophy antelope! You will either rent a vehicle and drive to the “meet your outfitter location” or be met in Calgary. A great hunt with plenty of time for that beautiful antelope trophy! Use vehicles for this spot and stalk hunt. Hunt the Eastern Slopes of the Rocky Mountains on horseback. Spot and stalk, calling and still hunting are the methods used. Deer can be added for a nominal charge if permits are available. Start/end the hunt in Calgary. Airport or hotel pick up included. Hunt the Eastern Slopes of the Rocky Mountains on horseback, a great spot and stalk hunt. One bear per hunter allowed in this unit. Expect to see color phases from blonde to chocolate as well as black! If booked well in advance this hunt is also available in the Fall. Hunt in Dec, Jan or Feb, Alberta has some of the biggest cats around! You will likely be staying in hotel, hunting in the foothills of the Rocky Mountains using snowmobiles and vehicles to find cat tracks. 6 Day Archery Elk & Moose Combination The hunt is conducted in mid-September in the Eastern Slopes of the Rocky Mountains. The elk rut is going strong at that time and the moose rut is getting underway. We can take up to two hunters. We usually focus our efforts on elk and treat the moose as secondary but we can do it the other way around as well. We use horses to get where we’re going on this hunt and then hunt on foot from there. Come in good physical shape and practice to 50 yards! Start/end the hunt in Calgary. Airport or hotel pick up included.